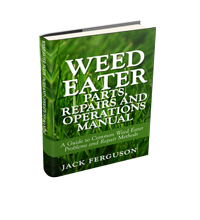 All Weedeater Featherlites require a carburetor adjustment from time to time. 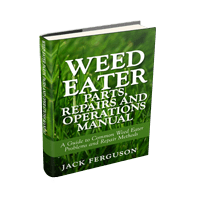 Weed wacker carbs will loose their tune because the adjustment screws may work themselves loose from vibration, fuel mixtures may slightly change or you may change the trimmer head causing a different load on the engine. The carburetor settings drastically affect the performance of your trimmer. All the weed eater trimmers use a two-stroke engine where oil is added to the fuel manually at a preset fuel to oil mixture. To adjust your carburetor you will need to find the two fuel adjustment screws on the carburetor body. The screws are highlighted as HI and LO. Simply speaking the HI screw allows the fuel adjustment of the weedeater at full throttle. Whereas the LO screw allows the fuel adjustment when the engine is idling. Adust both screws clockwise until just tight using the correct tool. This will be the reference position for adjusting the carburetor. Rotate the HI screw one and a half full turns counter-clockwise. Rotate the LO screw one full turn counter-clockwise. Open the choke by pulling the choke level all the way out or turning it to full. Start the weedeater by pulling the starter cord. The engine will sound out of tune and will fail to idle by itself. therefore apply just enough throttle to keep the engine running. Rotate the LO screw clockwise in one-quarter turn increments checking each time if the engine is idling smoothly. when you have found the sweet position do no further adjustments. Apply full throttle watching the engine. If the engine is sputtering then the engine is receiving too much fuel from the carburetor. Therefore rotate the HI screw clockwise in one-quarter turn increments checking each time if the engine runs smoothly. Again when you find the sweet position do no further adjustments.